Hell yeah, it’s a low carb breakfast! 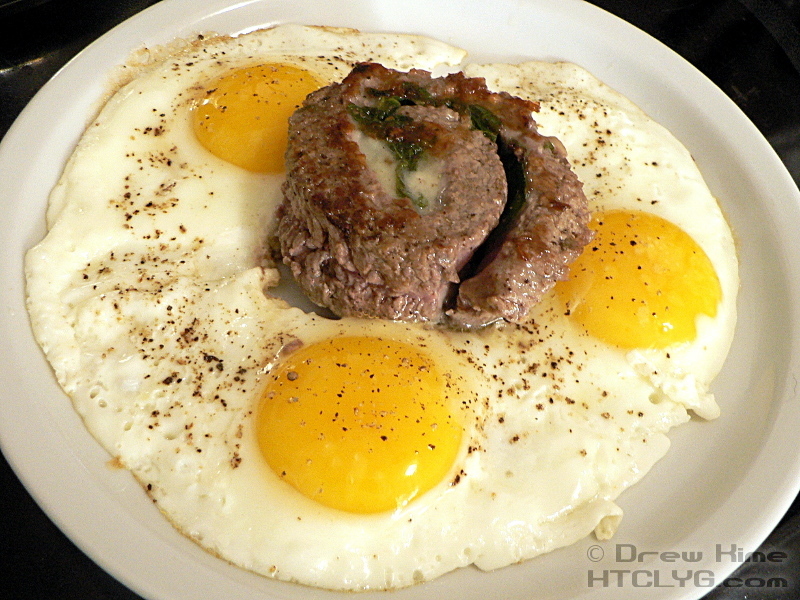 Who says you can’t serve flank steak rolled with spinach and swiss cheese for breakfast? I sure ain’t saying it. Jenn found these steaks at our neighborhood butcher’s shop — Hi Josh! — and bought a couple more than we needed for dinner. I think she expected them to be lunch the next day. I couldn’t wait. In case it’s not obvious from the picture, I just fried it up in a skillet with some bacon fat. Put a lid on top so it would cook through before it burned. When I flipped it over, I added the three eggs around it (with a little salt and pepper). Lid back on, until the eggs are just barely set on top, then slide everything out onto the plate. Oh my God, why did I spend so many years eating freaking cereal for breakfast? I dieted for nearly all my life, limiting myself to 1200 calories a day but something went off and in my brain and I couldn’t stand the thought of obsessing about what I was able to eat that day, constantly hungry and tallying calories. I always wondered why I would eat oatmeal or cereal, often with fruit, and still be hungry within 2 hours. That’s not a good breakfast. I find that a low-carb breakfast is great for filling me up without making me feel heavy and swollen all day. For a while, I was having coffee and a slice of banana bread for breakfast and wondering why I was still feeling bloated come lunchtime! Now it’s an egg, some smoked salmon (or other meat: smoked chicken or a steak), and a tub of yoghurt. Just as filling, and come lunchtime, my body has it all processed and is ready for more good stuff! I have not gone totally carb free yet. I have cut back on carbs significantly… as for breakfast, I definitely do better on a high protein breakfast; it stays with me longer. But I don’t _enjoy_ a carb free breakfast. I want a piece of toast or a flour tortilla with my eggs. A biscuit. something. Otherwise, I don’t enjoy the food. I haven’t had cereal in over a year, and while cereal has never been my favorite breakfast, I now crave it. Especially in the summer; I used to eat a bowl of corn flakes or special k or raisen bran for dinner with ice cold whole milk. To me it was a treat and a great way of not heating up the kitchen. (of course, at the time I felt more guilty about the whole milk!) I’m just not sure I’ll ever get “there”. Karen, for me it’s crunchy snacks I miss. I’ve been eating this way since just after Thanksgiving last year, and I find that I’m able to wait for the weekend to get my crunch on. Guilty pleasure: I get a snack-size bag of Cheetos on the way home from work on Friday, and usually finish it in the car before I get home. Used to be I wouldn’t have Cheetos except maybe when my wife bought them for a kid’s birthday party, but now I seem to get them about every second Friday. I lost my craving for “crunchy” snacks when I started using real salt on my food. I craved chips and popcorn for the saltiness more than the crunch. Made me wonder about how cravings are related to a lack of nutrition. I’ve noticed though that I will actually skip breakfast rather than eat a carb free breakfast. Sometimes I have a glass of whole raw milk and sometimes I just skip it completely. Breakfast used to be my favorite meal. I’ve been drinking raw milk, yogurt, kefir and kombucha and trying to increase fermented foods in my diet for about a year now. Focus has been on improving my digestion and absorption. I feel like I have lost weight and my clothing is looser, but I actually keep forgetting to weigh. That’s not really the issue any more; health is. p.s. I’m the Karen from above…. this time I signed in.